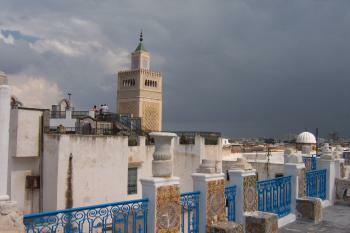 The Medina of Tunis was one of the most important Islamic cities. It contains some 700 monuments, including palaces, mosques, mausoleums, madrasas and fountains dating from the Almohad and the Hafsid periods. Aghlabid Ez-Zitouna Mosque ("Mosque of the Olive") built in 723 by Obeid Allah Ibn-al-Habhab to celebrate the new capital. The Dar-al-Bey, or Bey's Palace, comprises architecture and decoration from many different styles and periods and is believed to stand on the remains of a Roman theatre as well as the tenth century palace of Ziadib-Allah II al Aghlab. 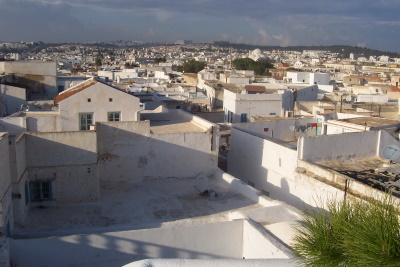 With an area of 270 hectares (over 29 hectares for the Kasbah) and more than 100,000 people, the Medina comprises one-tenth of the population of Tunis. Tunis was, compared to the Moroccan Medinas I visited, a rather enjoyable visit. It seems a bit cleaner, vendors are much less aggressive and it’s easier to navigate within the streets. The downside is that it lacks real highlights. It’s one of these places where you can aimlessly wander around for one or two hours and somehow nothing is really memorable. The government district and the Kasba are worth passing by. The main mosque was closed for non-Muslims. We walked from our hotel to the Medina. The rest of the center of Tunis is, compared to the others I saw in Tunisia, the closest to a decent city with a normal street layout and even a city train. 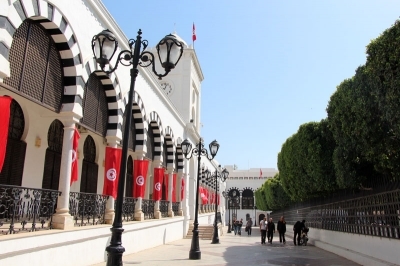 The Avenue Habib Bourguiba is mentionable, with the Tunis Cathedral and the theatre. For most, Tunis is probably an easy pick, as it’s the main airport to enter the country and several other WHS are within reach. It is good to see Meroë on the list for possible inscription in 2010. One of the “Top 50 Missing” identified by users of this Web site, it is incontrovertably “World class” and needs to be present on any credible UNESCO list, even though “Egyptian civilisation” is already quite well represented. I visited it in Dec 2005 – just we 3 visitors across the whole evening, night and morning we spent there - so different from the crowded sites in Egypt! Meroë is primarily about pyramids (Photo - there are an amazing 200 or so of them) and atmosphere – which you must sense as you clamber up and down the sand dunes to enter the enclosures just like some Victorian explorer getting there for the first time – oh and look out for the tablets with Meroitic script too! The T List documents rather strangely call it “The Island of Meroë”. I say strangely because it isn’t an “island” and is in fact located a distance away from the Nile, very much in the sandy desert. It appears that this phrase was used by Classical writers to describe the entire region from Atbara in the North to Khartoum in the south – at these 2 extremities, around 300kms apart, the main Nile is joined by the Atbara and Blue Nile rivers. These rivers on 3 sides led to use of the term “island” with some poetic license! The area was the heartland of the Meroitic civilisation around the 3rd Century BC at which time it was breaking away from centuries, first of political, and then of cultural subservience to Egypt. Use of Meroë by kings of the area continued through to around 200AD with links also to Aksum. The great sites of an earlier “Kushite” period when the Nubian provinces were in the ascendant some 4 centuries before Meroë are within the existing inscription of Jebel Barkal. There are in fact 3 significant Meroitic sites and, from the T List description, it appears that the other 2 at Naqa and Musawwarat es Sufra (both some distance south of Meroë) are to be included within the nomination. Interestingly, before the submission of Sudan’s latest T List each of the 3 sites was on the list separately – Sudan must have figured/been advised that the 3 sites together would make a more compelling nomination – hence the adoption of the “Island” title to encompass all 3! I visited these 2 also and would recommend anyone to try to take them all in rather than just see Meroë. However, unlike Meroë, they are some way off the main road (c 30kms) and you will need a private vehicle (and ideally a knowledgeable driver) to reach them (they are relatively close together) – whereas a bus will get you to Meroë. Naqa is primarily 1st century AD and shows Roman influences. Among other interests, Musawwarat has a fine restored temple and magnificent carvings. Both demonstrate Kushite “African” cultural influences but, unless you are an expert Egyptologist, you will need a good guide to point out the relevant aspects. You would ideally need at least 2 days from Khartoum return to take in all 3 sites – we overnighted twice (in tents) first at Naqa and then at Meroe before continuing north west across the Bayuda desert to “Merowe” and Jebel Barkal. Meroë does possess an upmarket “camp” of permanent tents run by an Italian company but we found the experience of “wild” camping almost in the ruins magical. A word about “Merowe” is perhaps called for. First it is a totally different place from Meroë (!!) and second it is the site for the building of an enormous dam by China at the 4th Cataract. This will impact your visit to Meroë in that an unsightly line of Pylons (of the electrical non-Egyptian variety!) disfigures the view – carrying power from the new dam to Khartoum. It also means that a spanking new road will have been built across the Bayuda desert making it rather easier to visit both Meroë and Jebel Barkal. What could prevent inscription? Well, at all 3 sites the management regime seemed somewhat “thin” – security is limited to some barbed wire and a poorly paid “ghaffir” who collects the permits which you are supposed to have obtained and paid for beforehand in Khartoum or Atbara – a significant nuisance if you are travelling up the Nile from Egypt by public transport! The reconstruction of the Musawwarat temple was done by Humboldt University so presumably should be ok by ICOMOS. But those electricity pylons? The main problem will be the earlier years of destruction and the extent to which it has been controlled. One problem shouldn’t occur again :- At Meroë in 1834 the treasure hunter Ferlini blew the tops off some 40 pyramids – unfortunately he struck gold with his first explosion and just kept going in the hope of a second success which never came. They aren’t meant to have “flat tops”! The old town of Tunis is one of the best medinas one can visit in the whole Arab world - and certainly one of the most accessible. It may not be overly spectacular, but it gives you a good impression of Arab history and culture - and it is definitely cleaner than, say, Cairo. A nice cup of tea and some haggling in the bazaar make for an enjoyable day. The Medina of Tunis is perhaps the best Medina in the country, whilst the sites are nothing spectacular, and you can walk straight past them if you do not keep an eye out!, but the atmosphere of the labyrinthine streets is great! The main way through is just an endless stream of shop keepers trying to sell you souvenirs, but if you duck off down some side alleys and get to some other markets you will start to see more of the real Tunis. It takes some time to really get acclimatised to Medina life but once you do it is great! The central mosque I found to be a little disappointing especially as, not being a Muslim I had to pay just to walk through the gate to a very small viewing area to see a courtyard that was being renovated. The best thing to do is just to get in and wander aimlessly, buy things from the vendors; especially the Barbary Figs (Prickly Pears!) they are sold on carts the whole way around the medina and they cost 100mils. (About ,08 € cents) and they even get peeled for you, go into a tea room and just sit with the locals who are ridiculously friendly, then go off and barter for some souvenirs. Tip: if you want some roof top views many of the shops have terraces which you can go up to but don’t expect to get away to quickly when you come down to quickly as you will at least have to look at the carpets and pipes (at special price for you because they like you) or alternatively use a camera in front of the main mosque and within a few moments you will have some one showing you around with a few stops at their ‘brothers’ perfume shops, It is all part of the fun though! Ibn Battuta: "So at last we reached the town of Tunis, and the townsfolk came out to welcome the travellers." Ibn Khaldun: Born and educated in Tunis and started working as a calligrapher for the ruler c1350. Tunis has erected a statue commemorating this "son of the city" but situated outside the medina in the Avenue Habib Bourguiba.